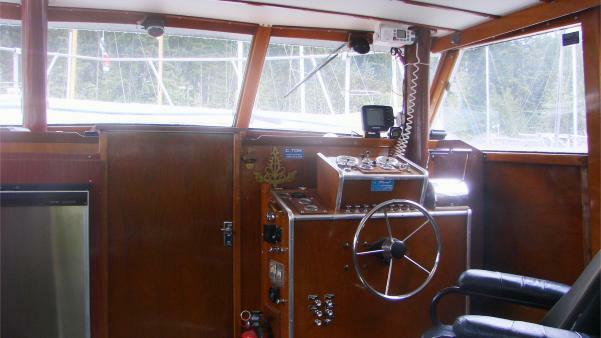 This is a 1969 38' Royal Tri-Cabin that has been restored and upgraded. It has been out of the water for over 7 years and over $65,000 spent not including labor. Located in Desolation Sound near Lund, BC, where it's been cruising for the past 2 years. A very comfortable vessel to cruise aboard. There has been 2 surveys done on this vessel - 1st one during the upgrades to be sure the vessel was sound before preceding and the most recent survey was for insurance 2 years ago before launching. Selling due to deteriorating health. Centerline length (Bow to Transom): 38' 3"
glass. Interior is of mahogany. Displacement 15000 lbs, LOA 40, beam 13. 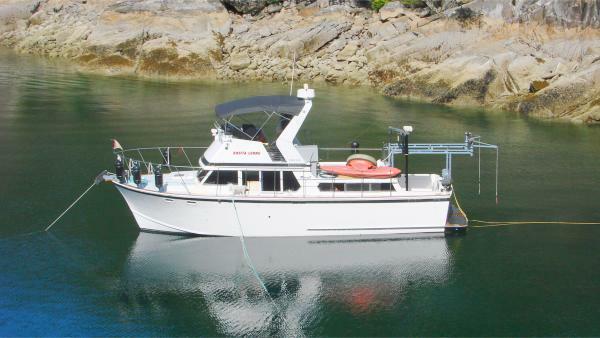 This boat would make a very comfortable live a board and has lots of outside space for activities. It's powered by professionally rebuilt Chrysler V8 twin engines, borg warner & walter V drive trannies. The transmissions were taken apart, inspected & 2 were rebuilt. 2 helm stations, one inside and one on the command bridge. The engines are located outside of the cabin areas, under the aft cockpit, which makes for a quiet interior ride. Engines have new heat exchangers, raw water pumps, marine alternators & marine carburetors. All plumbing is new - gray and black water tanks each with it's own macerator pump plus vacuum clean out. 2 anchors (a large danforth & large rocna ) Right behind the chain locker is the forward cabin with bunks on the left , closet & head to the right. 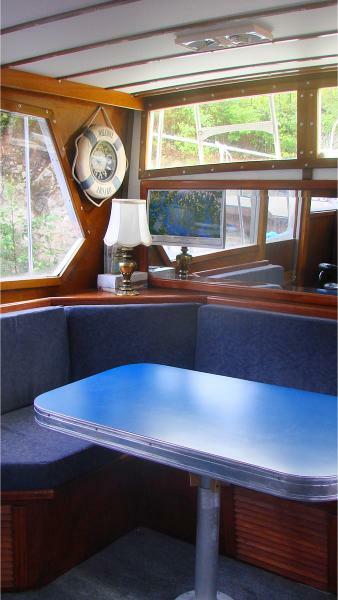 Next is the main salon with inside helm station, galley, dinette and side access to decks and large windows all around. 7 - 8 mph and burns 1.5 gallons per hour for each engine. The boat also cruises comfortably at 10 mph. New props + spares. All new carpets & upholstery.